District city in the government of Kovno, Russia. It had a prosperous Jewish community in the first half of the nineteenth century, and was a center of Haskalah, or progressive ideas, when Abraham Mapu lived there (1837-44). He lovingly recalls the time when he met kindred spirits like Senior Sachs, Shapiro, Emanuel Soloweitschik, and Marcus Wolpert in the house of Abraham Wolfsohn (letter appended to vol. ii. of "'Ayiṭ Ẓabua'," partly translated by Rebecca Altman in "The First Hebrew Novel," in "The New Era Illustrated Magazine," Dec., 1904). But most of the men who were animated by progressive ideas left Rossiena for more promising fields of activity in larger cities, and a fire which almost totally destroyed the city in 1865 and the hard times which followed the brief period of revival in the first part of the reign of Alexander II. contributed to the city's decline. 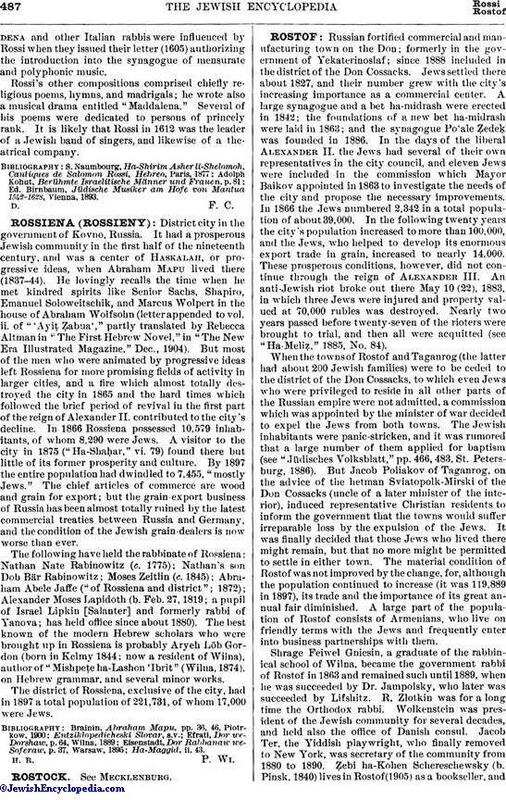 In 1866 Rossiena possessed 10,579 inhabitants, of whom 8,290 were Jews. A visitor to the city in 1875 ("Ha-Shaḥar," vi. 79) found there but little of its former prosperity and culture. By 1897 the entire population had dwindled to 7,455, "mostly Jews." The chief articles of commerce are wood and grain for export; but the grain-export business of Russia has been almost totally ruined by the latest commercial treaties between Russia and Germany, and the condition of the Jewish grain-dealers is now worse than ever. The following have held the rabbinate of Rossiena: Nathan Nate Rabinowitz (c. 1775); Nathan's son Dob Bär Rabinowitz; Moses Zeitlin (c. 1845); Abraham Abele Jaffe ("of Rossiena and district"; 1872); Alexander Moses Lapidoth (b. Feb. 27, 1819; a pupil of Israel Lipkin [Salanter] and formerly rabbi of Yanova; has held office since about 1880). The best known of the modern Hebrew scholars who were brought up in Rossiena is probably Aryeh Löb Gordon (born in Kelmy 1844; now a resident of Wilna), author of "Mishpeṭe ha-Lashon 'Ibrit" (Wilna, 1874), on Hebrew grammar, and several minor works. The district of Rossiena, exclusive of the city, had in 1897 a total population of 221,731, of whom 17,000 were Jews.